The playbill of the second recital of Lied, Lemon organized by the Teatro de la Zarzuela and the National Center for Dissemination of Music, article contains a delicious musicologist Cristina Aguilar which begins:"Never melancholy was a sign of national identity as clear as in Russia. Fyodor Dostoyevsky held: "The really great men must experience, as far as I know, great sadness' ". 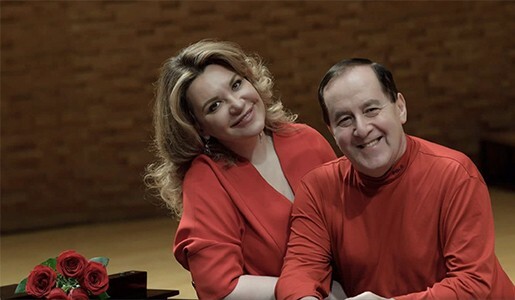 And it has been Ekaterina Semenchuk (Minsk, 1976) and his accompanist Semyon Skigin responsible for transmitting the Russian melancholy burden so aptly described by Dostoyevsky. He did it with a rare repertoire in this cycle of Lied, something that is appreciated. Nor it can say is his usual repertoire, but it certainly demonstrates a stranglehold when run. A program divided into two parts of different themes. Some works of most popular character in the first part with music by Nikolai Rimsky-Korsakov, Cui, Found Blákirev, Aleksandr Borodin y Modest Musorgsky. And a second part full of romance and dedicated to Pyotr Ilyich Tchaikovsky. Many are the vocal qualities of this Byelorussian mezzosoprano. Issues as naturally and easily the gravest notes as acute and recreated into a powerful central register. All in perfect balance and solvency. Nor lacks theatricality, especially in some of the tips with which he regaled the audience very generously. Whatever the repertoire, Ekaterina Semenchuk solves it flawlessly and security in each of the land Treading not surprising. Accompanied on piano by Semjon Skigin, one of the leading representatives of the legendary piano school in St. Petersburg. He is debuting in this cycle of Lied with a technical and impressive mastery. Extremely high level Lied cycle that continues the 12 November with low Franz-Josef Selig, accompanied on piano by Gerold Huber. Essential!